I finally made it to the Wicker Park farmer’s market this past Sunday. 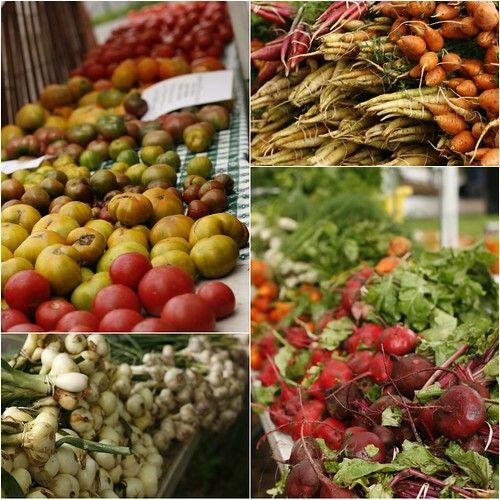 It’s a small market just a few blocks from our house, but they have all the necessities – a couple produce vendors with a nice variety of fruits and veggies, a couple meat vendors, baked goods, one Wisconsin cheese stand, and a couple flower vendors. I woke up to thunderous storms, so as soon as the rain let up, I made my way down there. It was a muggy, gloomy morning, but that meant there weren’t many people in the park, which made for a pleasant market experience. The first stand I came across had rows upon rows of heirloom tomatoes. I couldn’t pass them up. 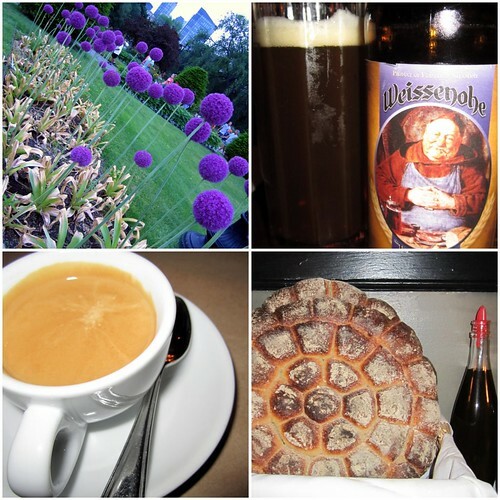 Then I saw the garlic – everything from the scape to the bulb. I knew the combination of the heirloom tomatoes and garlic scapes would be perfect is a fresh, summery chilled soup. Oh my it was good. So so good. Those tomatoes – wow – and with a mild bite from the garlic scapes, I really feel I outdid myself here. I also found baby fennel, which I roasted and threw into the mix. Just perfect for that hot summer day. Prepare croutons with the bread cubes by layering in a single layer on a baking sheet and toasting them in the oven. Take one layer of the raw baby fennel, a sprig or two of fennel greens, the unpeeled cucumber, a couple of the garlic scapes, and carrots – finely chop them or julienne them and combine to form a crisp salad. Drizzle with olive oil and lemon juice and set aside. In a blender, combine the tomatoes, peeled cucumber, roasted fennel, garlic scapes, raw garlic clove, cumin, jalapeno, salt, pepper, and red wine vinegar. Drizzle some olive oil in the mixture and blend into a smooth puree. Taste to see if it needs more vinegar, oil, or seasoning. Adjust as necessary. Serve with the salad, some slices of avocado, and croutons on top. 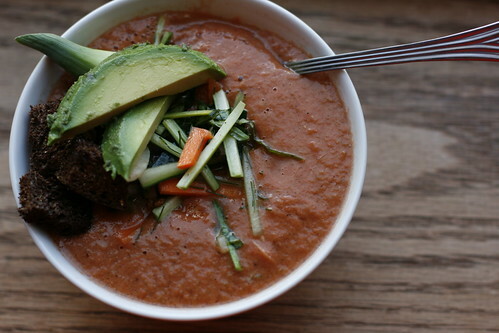 The soup will be thin and soupy, while the salad provides a nice crisp texture. Ever since it has started feeling like summer around here, I have felt so busy. And not really busy, but more like I-must-be-outside kind of busy. As in, I can’t stand the thought of sitting inside in front of the computer when the sun is shining through my window and I have friends on patios somewhere in the city with cold beers. So forgive me for not cooking much lately and therefore not posting much either. Eric and I seem to really like polenta. It’s so easy to make, only mildly time-consuming, and goes so well with most other things I can pull out of my fridge at any given time. This night, I had some lacinato, aka dinosaur, kale. I often just prepare kale sauteed with garlic. 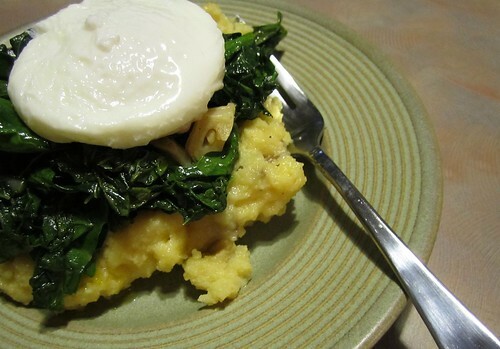 This night was no different, but the addition of a poached egg and polenta really made for a filling meal. The sesame seeds in this polenta really made for a nice, interesting texture, too. Start the polenta by boiling the milk and water in the same pot. When it just comes to a boil, season the water and whisk in the corn meal until all the lumps are gone. Stir in the parmesan cheese and sesame seeds. Reduce heat and let the polenta cook for about 15 minutes. Pour the polenta onto a plate and let cool a bit. For the greens, saute the garlic in the olive oil over medium-high heat. When they become aromatic, toss in the kale, cayenne pepper, and salt and pepper. Continue to saute until the kale starts to be come soft – around 5-10 minutes. 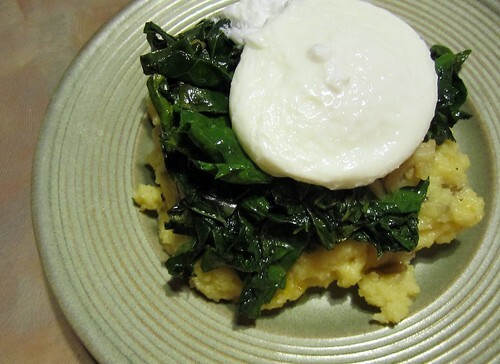 Together, the kale and polenta make a great meal. 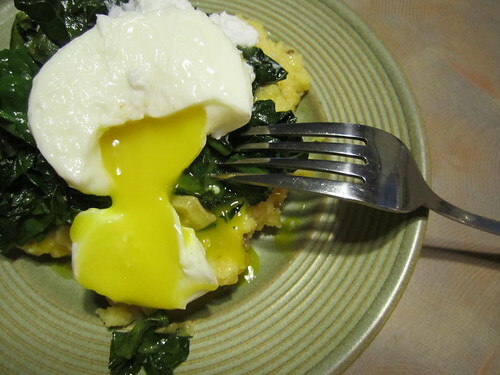 But, like most things I cook, adding a poached egg puts the cherry on the cake. Sorry for the absence. I’ve been so busy and not really cooking anything memorable lately, so I figured I’d share one last spring pesto. This one is one of my favorites. This past weekend we were in Boston, eating more food than the human body should normally be able to handle and visiting my lovely soon-to-be brother-in-law and his lovely girlfriend. You can read more about that over at Hungry City Blogs tomorrow, but I will tell you that I love Boston not only because I get to see two people I adore, but also because it seems like every single corner in that city is covered by trendy restaurants and bars – good food and beer everywhere you look. My kind of city. So this pesto. I promise it’s the last one! Especially since my quasi-CSA informed me today that this is the last week of local asparagus. This pesto is so great though. The flavor is sort of mild and understated, yet subtly sweet. Perfect with some whole wheat pasta and more asparagus. Cook the asparagus and peas in boiling water for just a few minutes – enough for the peas to un-freeze and the asparagus to get just tender but not mushy. 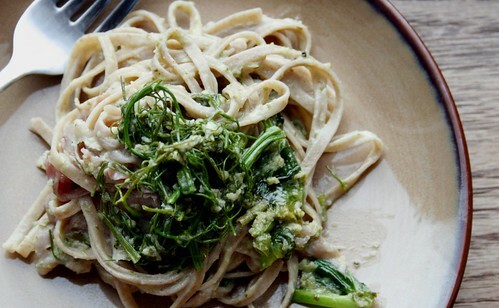 Toss those in a food processor with the rest of the pesto ingredients and blend to combine. Cook the pasta according to package directions, tossing the rest of the asparagus in about half way through. When you turn off the heat, submerge the spinach then quickly drain, preserving a bit of the pasta water. In a saute pan on medium high heat, heat the pesto then combine with the asparagus, pasta, spinach, and a splash of pasta water (add more water until you get a consistency you want). When pesto sticks to pasta nicely, serve. It is a seriously rainy day out there. I had hoped to get up early, run to the farmer’s market, and bring home a boatload of veggies, but I obviously failed to check the weather forecast. So instead, I think I’ll do some “work”. Later tonight, I have a taco crawl planned – research for my next blog post on Dish Kebab (my first post comes out June 11!). I hope the rain can stay away while we crawl to nine taco joints in my neighborhood. Anyway, I made these lamb burgers quite a while ago now. It was my first time working with lamb, but it turned out to be awesome. 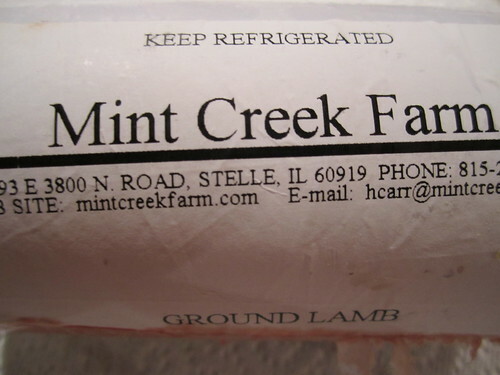 I had this local, organic ground lamb from Fresh Picks – a sort of CSA without the subscription. In the kitchen, I am executive chef, Eric is sous chef. I conceptualize dinner, Eric helps me pull it off. When it comes to burgers, he is always the one to mix the meat amalgamation together and form the patties. It’s something I just can’t do – residual effects of 12 years of vegetarianism. The only problem with this is that he feels he should be able to get six teeny tiny patties out of one pound of meat. I keep trying to get him to make bigger patties, even if it means you only get four patties. I’m working on him, but you’ll notice the small burgers (especially compared to the bun) in these photos. For the burgers, mix all ingredients together in a mixing bowl, being careful not to over-mix or over-handle the meat. Form four patties and cook for a few minutes on each side, either on a grill or stove-top pan. For the tzatziki, just mix together all ingredients. This stuff is addicting and delicious. I was eating it with a spoon straight from the bowl. To assemble, toast the buns either in the oven or over the flame of a gas stove. 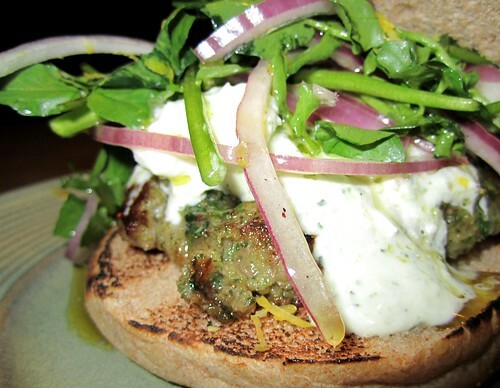 Place the burger on the bottom bun, then spoon the tzatziki on top. Finish with some of the salad and top bun. Eric is one lucky man. He’s at the gym right now bulking up (maybe I’m the lucky lady…); meanwhile, dinner is made, dishes are cleaned, and I’m now working at my second job, ie this blog. Ok, I lied, dishes aren’t clean… but I made dinner, and it was fab. 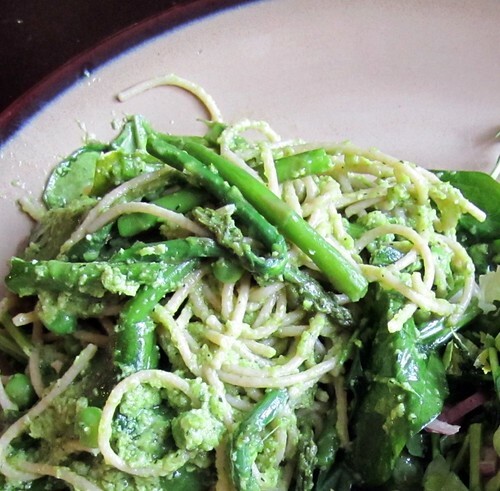 I feel like a one-note lately – so many salads, dinners with asparagus, and of course, pesto. I’m not straying from my pattern at all tonight, either. 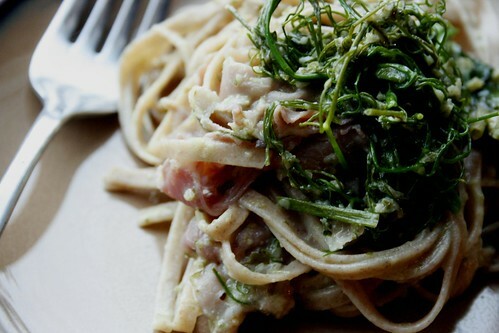 I still have proscuitto, I still have pea vines, and I still have that delicious green garlic pesto. 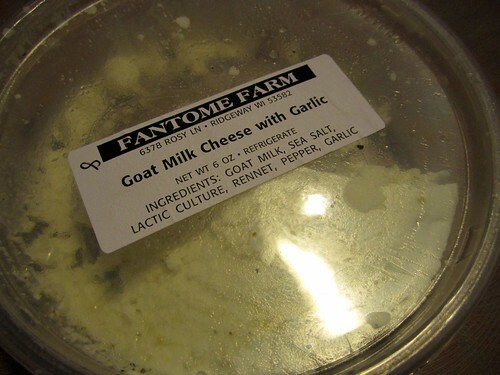 Plus, I have some awesome goat cheese from the Madison farmer’s market. A pasta was in the works. 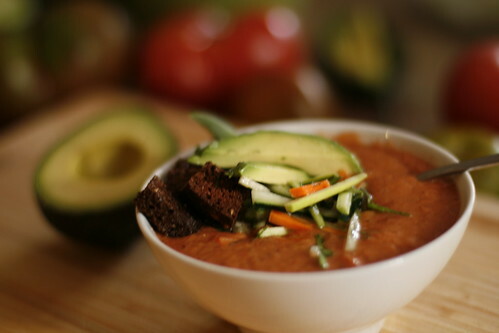 I would say my general food philosophy involves real foods, homemade foods, healthy foods. I generally avoid processed foods – anything in a jar, plastic packaging, or a box – save for dried whole wheat pasta, Kashi crackers, and whole grain cereals. This dish tonight is not the epitome of health, but not even the pasta is processed this time. I found this great fresh, whole wheat pasta at our local store – perfect. Cook the pasta per package directions in salted water. Reserve 1/2 cup of the pasta water after straining. In a saute pan, heat the pesto. 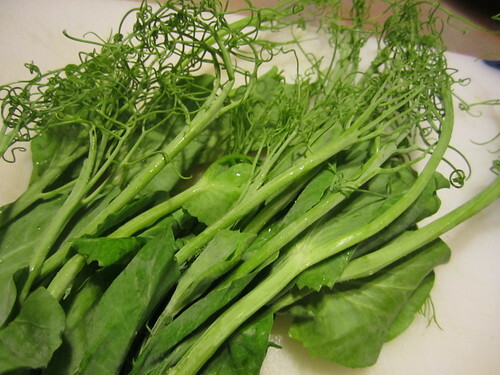 If using pea vines, toss them in now, as well as the proscuitto, torn in to pieces. If using spinach or other more fragile greens, wait until the very end to put them in the mix. Pour in the white wine and let simmer for a minute or two. Stir in the goat cheese. Then put in the reserved pasta water and pasta. Toss all together to combine. Another it was fate dinner. 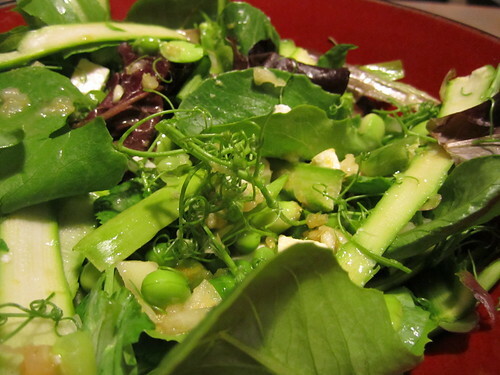 I came home and upon checking my Google Reader, saw this recipe for a Shaved Asparagus Salad. I had greens, I had asparagus, I had both peas and edamame, and I even had proscuitto. Like I said, it was meant to be. Of course, in my hunger delirium, I completely forgot to top the salad with proscuitto, but it didn’t matter. All was well in salad land. This weekend we were in Madison to run the Madison Marathon (Eric, my sister Keri, and my uncle Bob all ran the half marathon, and my friend Caroline ran the quarter marathon!). I don’t want to talk about the marathon – it was bad (hello 93-degree day) – BUT, while in Madison, we got some amazing vegetables at the farmer’s market. If you’re anywhere in the Midwest, even in, say, Missouri, I’d say it’s worth it to make it to Madison just for the market. It’s that good. I bought these really cool pea vines – something I’ve never seen before – and I couldn’t wait to try them. They’re all tangled together and crisp like asparagus, but the flavor is still that of a fresh garden pea. They’re awesome. 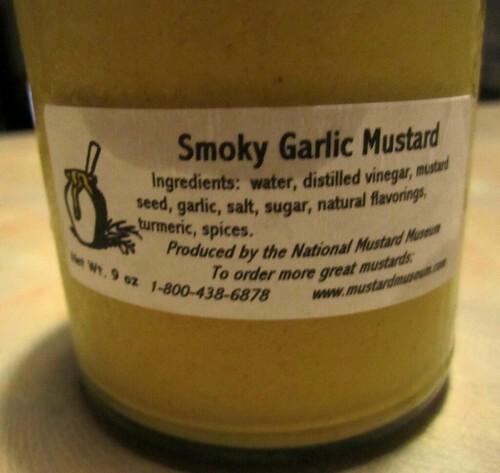 I made my typical vinaigrette with this smoky garlic mustard. Yum. Bring a pot of salted water to a boil and toss in the peas and edamame, cook for 3-4 minutes, then drain and rinse with cold water. Using a vegetable peeler, shave the asparagus into thin slices. Cut the tips off and set to the side. 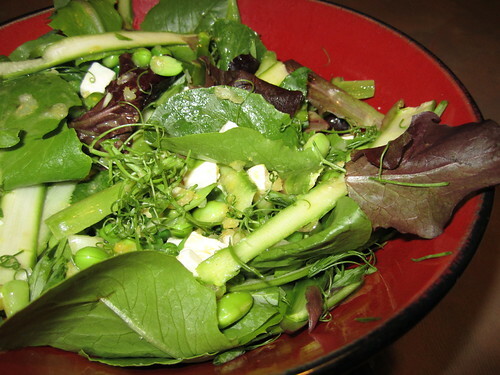 Assemble salad ingredients by layering the lettuce, asparagus, peas/edamame, pea vines, and feta. For the dressing, whisk together the minced shallots, lemon juice, lemon zest, olive oil, and salt and pepper. Pour over salad.